text love on hand and blur tree background. Still, when attempting to talk about the history and influence of the conservative evangelical organization, Focus on the Family, it's particularly difficult not to plunge head first into the dark waters of "Us vs. Them" as one its LGBTQ descendants. However, Amber Cantorna, a Focus executive's daughter, inspires us to try. They can't find a way to agree to disagree... It's unfortunate, it doesn't have to be so divisive. Her words echo those wounded by the responses from their Christian families and communities. That's why she's prepared to share her growing up and coming out experience as a Focus Family daughter. With an aim for change as well as aiding support through resonating stories, Amber describes her family as very close-knit, shielded within a sphere of like-minded people. She was homeschooled k-12, graduating from college at the young age of 18, all the while wearing her purity ring after signing a sanctity covenant. Although she had her church community and homeschooled groups, she waited on God to bring the right person for her future spouse, just as she was encouraged to do within the conservative evangelical world. Finally, around her early mid-20's, Amber began falling for someone -- her female roommate. After years believing God was simply protecting her from unnecessary romance troubles, it started to make sense as to why she had little interest in boys. She explains how she lacked the terminology to grant what was happening at the time due to the absence of diversity in her life. But in 2012, this concert pianist and sign language interpreter eventually found the words to tell her parents, "I'm gay." After her parents responded by walking out, short, distant exchanges followed. She remembers their talks along the lines of wanting her to go to therapy but not wanting her to tell anyone, saying, "It might ruin your reputation." She nods as she recalls those wearisome conversations, "They meant it would really ruin their reputation." Also in 2012, Jim Daley, current president of FOTF, shares a similar experience. In his book ReFocus: Living a Life that Reflects God's Heart, he describes a coffee meeting with a prominent "homosexual advocate," as one of the "most beautiful moments" in his twenty-plus years of ministry; yet, he's immediately probed back at the Focus office by someone admonishing him on how embarrassing it might be if word got out he was associating with a gay person. Daly's response? I told him I was surprised that a fellow believer would think that showing Jesus' love to someone would somehow compromise or thwart God's ultimate plan. Amber stayed in Colorado Springs (home of FOTF) a while longer, but with the constant anxiety she describes as "always looking over my shoulder." While surrounded in the unavoidable fishbowl within her well-known family in a familiar community, she was also accompanied by depression, seclusion and eventually thoughts of suicide. However, Amber's resilience helped her find the support she needed to endure and eventually join Highlands Church in Denver, Colorado, where she also met her wife, Clara. Unfortunately, communication is currently stymied between Amber and her parents, particularly after they specified that while Amber would always be welcomed (whilst her house keys were asked for) Clara would not. 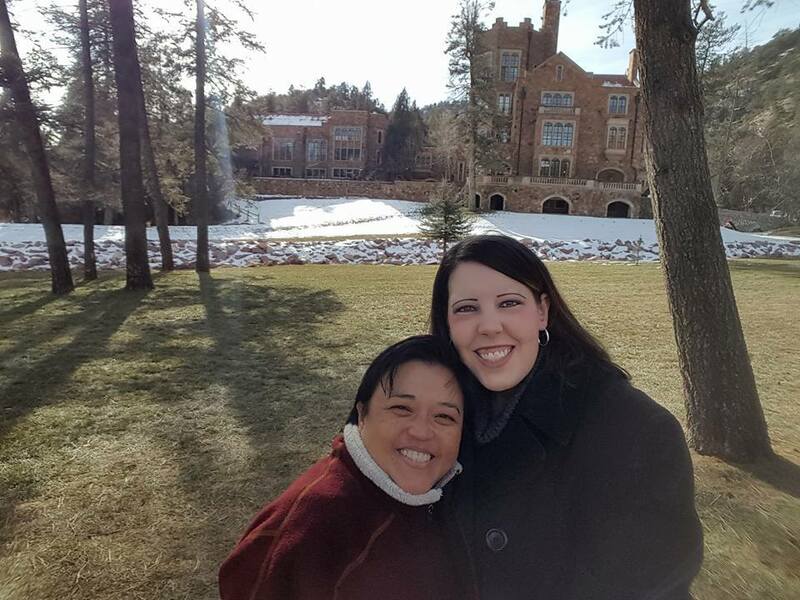 She wishes her family would allow the opportunity to meet her wife, saying, "If they looked at the list of qualities they always prayed for in my future spouse, they would realize Clara meets every one of them." Though devastated by her Focus Family's reaction, she also regards their investment of values she carries today. Indeed, Amber illustrates the poise she learned. In a compelling speech, she articulates how her parents are unable to see her past, her gayness. But instead of seeing them so narrowly in return, Amber withholds sharing her father's name, admitting they instilled a lot of good in her too. Although not hidden, she's not willing to drop their names under the proverbial bus. Contrast this with Focus on the Family's retired patriarch, Dr. James Dobson, who continues to consider the LGBTQ as unwelcomed threats in churches and homes, despite stating once he has "no interest in promoting hatred toward homosexuals..." I say this after listening to not one, but three of Dobson's newscasts since 2015 still referring to the LGBTQ community as foes to our nation rather than family members and friends. Dobson, once a licensed psychologist in the state of California, was also an associate clinical professor of pediatrics at the University of Southern California (i.e. child psychologist). His credentials were an incredible service to him for establishing FOTF. And, while not an ordained minister or having a theology degree, somewhere along the way, Dobson took on the role of cleric over psychologist. In 2005, two years after leaving FOTF, The New York Times referred to Dobson as "the nation's most influential evangelical leader," particularly in the political arena. Undeniably, his influence persists today as many still follow his lead. Daly graciously explains their different leadership style and direction as the difference between a prophet and an evangelist, Dobson being the former and he the later. However, Amber's Focus Family story is a perfect example of the contrast in their guidance and their followers. I know underneath anger (secondary feeling) is hurt (primary feeling). The ego/self/Id, what have you, wants acknowledgment and acceptance as an individual. The spirit/soul/psyche wants justice for self and others when our distinctions are separated and stigmatized. For those in the mental health and helping fields, such awareness, concern and respect for diversity through continuing education, or CE, is a mark of ethical responsibility embraced in professional acumen. In fact, it is required for licensure. I don't believe Dobson's forgotten his many years hedged in principles underscored in every health association's Code of Ethics: autonomy (the right to choose and act on their own); beneficence (actively attempt to benefit another in a positive manner); nonmaleficence (avoid causing harm); justice (all receive equal treatment); and fidelity (be loyal and uphold truth). But frankly, it is disconcerting how someone with such training disregards the numerous reports of LGBTQ suicide, particularly among families with rejecting behaviors. As well, throughout ministry, family therapy and conflict resolution, consideration for the "other" is a significant element (e.g. love thy enemy; do unto others; place yourself in their shoes), whether or not an agreement's attained. Moreover, in ministry, as is in the secular world, it's fairly understood that peace with God, higher being or self often comes after you have made, or at least attempted to make peace with your brother, sister, neighbor, fellowman, etc. Conversely, peace rarely comes by way of avoidance or denial -- not interpersonally or intrapersonally. Therefore, I stand firmly with Amber beyond the edge of the categorically simplify sinkhole deeming this not as "Us vs. Them," a war on conservative evangelicals or Focus on the Family, or even on Dobson overall. This is a call for accountability on behalf of a single issue requiring what Daly proposes: a critical refocus. Additionally in 2012, Alan Chambers, president of the international ex-gay ministry, Exodus, came out once again, this time apologizing for the distress their ministry caused to the majority of its people who had not changed. One year later, and five years after Focus on the Family sold its ex-gay ministry (Love Won Out (aka True Story) to Exodus International, Exodus closed its doors recanting. 1Wilcoxon, S.A., Remley, T.P., & Gladding, S.T. (2012). Ethical, Legal, and Professional Issues in the Practice of Marriage and Family Therapy. (5th Ed). Boston: Pearson.